Peerless Blowers High Pressure Radial Belt (PWB) blower Â is used in industrial applications for small exhaust systems where air is laden with dust or grit and also for supplying high pressure air for conveying and cooling. 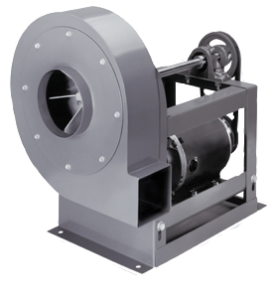 The PWB belt drive blowers are available in 5 sizes ranging from a 7-3/4 to a 13-1/2″ wheel. The CFM range is 60 to 2322 with up to 15″ water gauge. The fans have cast aluminum radial blade wheels. The fans are available in arrangement 10 and have a maximum operating temperature of 180 degrees F.
The PWB belt drive fans are designed with a heavy-duty housing and base. All fans are available in either clockwise or counterclockwise rotation and the housings are rotatable up to 8 different positions. All of the fans are available with either single or three phase motors in a variety of enclosures. All direct drive radial blade fans are tested in accordance with AMCA codes and standards.